This May 1-4, 2014 changes are afoot. 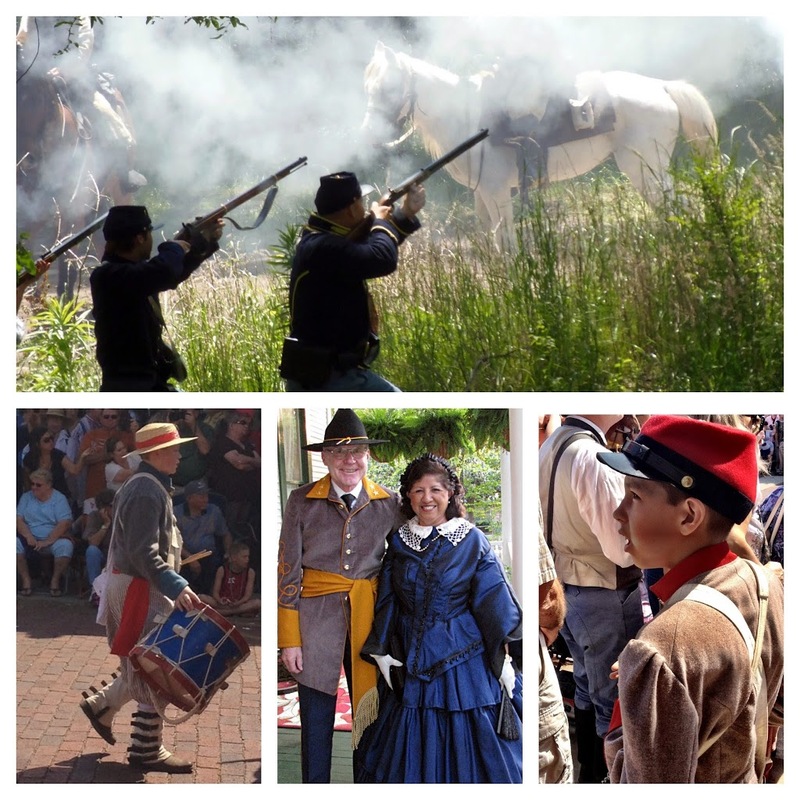 Jefferson’s 67th Annual Pilgrimage and Civil War Re-enactments weekend has some exciting new events and some changes to the usual festivities. In the past tours of historic homes were the norm; this year five of our historic churches are opening their doors for tours. It’s an exciting change of pace. You see those iconic steeples around town, but have you ever gone into one of the churches? Now is the time to see all the unique stained glass, pulpits and rows of benches that you have been curious about for so long. Other new things to do while in Jefferson Texas this year are a Naval Battle viewed aboard the historic railroad cars of the train. Seated aboard the train you will experience the Andrews Raid and then stop to view the guns ablaze from both the land and the water while canons fire from the gunboat and troops defend the land all around the train. Each ride will stop to watch the battle; you are right in the middle or the foray. There is no other civil war battle quite like this that I’ve ever heard about. The street dance on Friday May 2, 2014 downtown is also a first; historic attire is encouraged but not required. Everyone is invited and welcome. All of the other events around town that you have come to love during the weekend are still going to be here too so get in your car and come on over for the day or the whole weekend you won’t be disappointed. Be sure to click “Read More” to see the list of the whole weekend’s schedule. A Day of Learning for school groups, sponsored by the Marion County Chamber of Commerce. The Living History Camps will demonstrate Camp Life and Military Activities and include a train ride aboard the Historic Jefferson Railway as the story of The Andrews Raid unfolds alongside the Big Cypress Bayou. Complete with a gunboat and cannons, the train departs from Diamond Don RV Park on Friday at 9:30 AM – 11:30 AM and 1:30 PM Special Price for Living History is $3 per student; train ride is $5 per student. Friday May 3rd and Saturday May 4th from 5:30 PM until 7 PM. Stroll through some of the finest yards and gardens in Jefferson. Saturday May 3rd at 10 AM downtown, usually the re-enactment skirmish is downtown immediately following the parade right on Austin St. DON’T leave downtown before the skirmish!! Sunday May 4th Narrated Day Tour: 11:30 Ticket price is $15 plus tax; lap children under 4, FREE. Ride an antique narrow-gauge train and experience the story of The Andrews Raid, the Civil War’s most gripping railroad story. Soldiers from the North and South re-enacting the Great Locomotive Chase and new this year the Naval Battle of Port Jefferson; complete with cannons and gunboat join the battle making it the largest naval Civil War Re-enactment West of the Mississippi. More information can be found at the Marion County Chamber of Commerce Upcoming Events Calendar. This entry was posted in Battle Re-enactments, Spring Events by Tammy D. Bookmark the permalink.